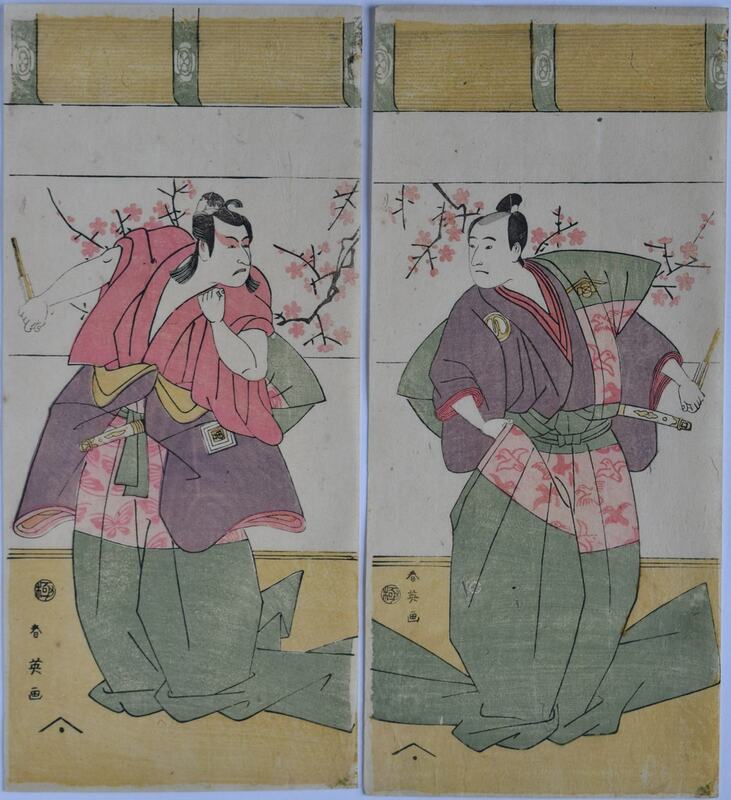 A hosoban diptych complete showing Ichikawa Monnosuke II ( left sheet ) as Soga no Goro and Sawamura Sojuro III ( right sheet ) as Soga no Juro in the play Shunshoku Edo-e Soga performed at the Ichimura-ya in the first month of 1791. Published by Harimaya Shinshichi. Most hosoban multiples have become separated over time. Very good impression, colour and condition. Completely untrimmed. 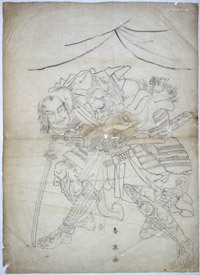 Signed Shun’ei ga.
An original Shun’ei brush drawing showing the Soga brothers revenge on Suketsune in his tent. 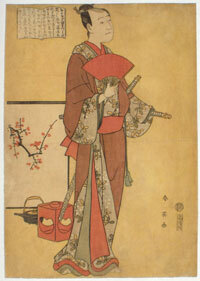 This appears to be a preliminary design for a print illustrated in Ukiyoe meihan, 500 Ukiyoe Masterpieces, no. 85, p. 39 but with the figures facing the other way. 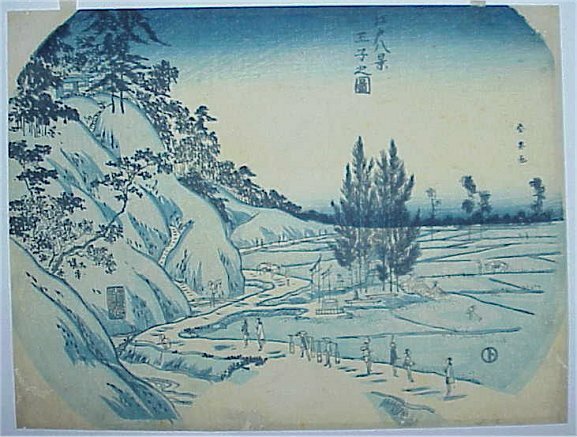 The print published by Nishimuraya Yohachi, c. 1798. 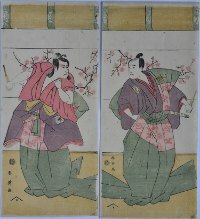 On thin Japanese paper, 14.75 x 10.5 in, 37.5 x 26.5 cms. Fully signed Shun’ei ga. Sold “as is” with all imperfections. Drawings of this period are rare. 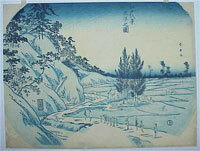 An aizuri-e fan print: Oji from Edo Hakkei. Apparently an unrecorded print. Very good impression and colour. Several repaired wormholes at bottom, otherwise good condition. 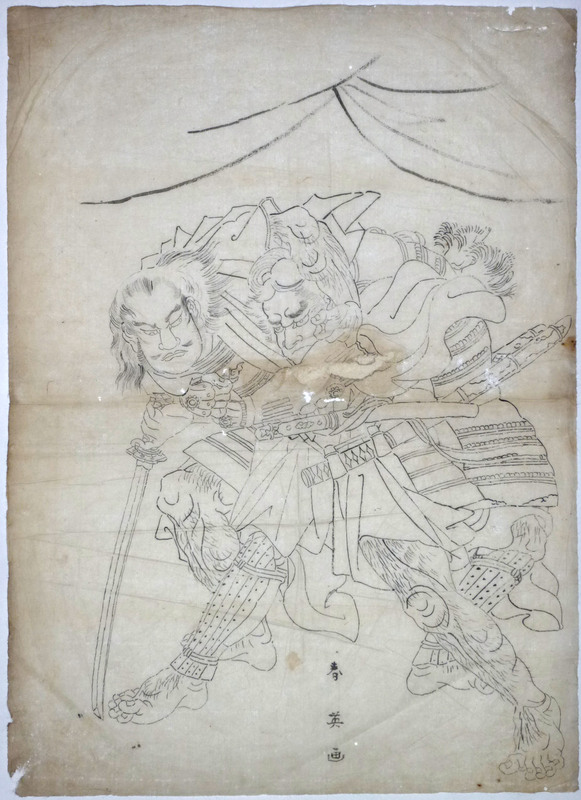 Signed Shunei ga.
An extremely rare yellow-ground aiban showing the actor Sawamura Sojuro III in the role of Nagoya Sanza in the play Keisei sanbon karakasa performed at the Miyako-za, 7/1794. In fact Shun’ei designed another print of the same actor and role, see the Walter Amstutz collection, Sothebys, 1991, lot 98. Shun’ei – the originator of the ‘Big Head’ – was something of an eccentric and a great lover of the theatre and sumo. Fine impression with unfaded colour. Slight soil with small backed areas and slight horizontal creases, but generally very good. Signed Shun’ei ga. The actor Segawa Kikunojo III as Yasukata performing a vigorous hobby-horse dance in Godai Genji mitsugi no furisode. Published by Tsuruya Kiemon c1790-91. Ex Tamba collection (seal bottom right). Very good impression, colour and condition. Signed Shun’ei ga. The actor Matsumoto Koshiro IV. One of a rare series of bust portraits, each with the haigo ( poetic ) name and a fanciful title. Here: Kinko and Koraiya. Koshiro was well known as a haiku poet. Published by Iseya Jisuke, c early 1790s. Originally purchased by me at Sothebys, 13/12/1993, lot 12. Very good impression. Slight fading, otherwise very good condition. Full size. Signed Shunei ga.